Heat a small nob of butter in a pan with the caster sugar until it caramelises. Add the remaining filling ingredients and simmer for 3-5 minutes. Pour into an oven proof dish and set aside. To make the topping, place the flour, sugar, butter and cinnamon in a bowl together and rub with your fingertips until it has formed breadcrumbs. Add the granola and stir until well combined. 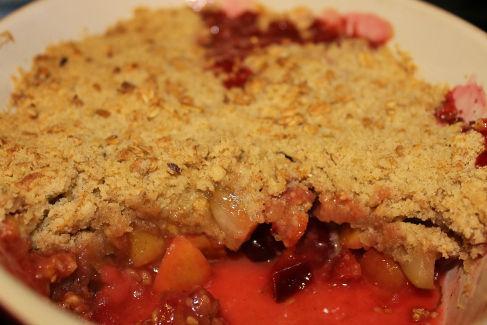 Scatter the crumble mixture over the fruit and bake in the oven for 30 minute until the top is golden. Serve hot with custard, cream or ice cream.